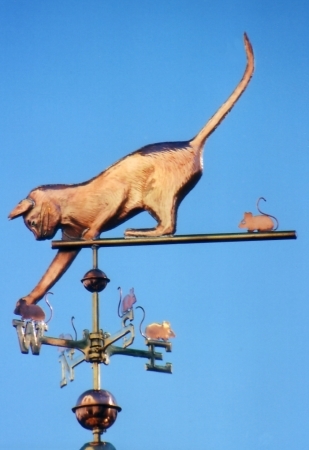 Shown here is our Cat Weather Vane Playing with Mice. It is a sweet, sleek depiction of a cat doing what cats love to do! 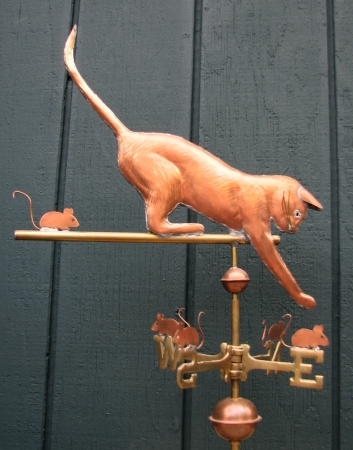 Our own cat, Solder, served as the model for this particular weathervane design. One customer requested an optional gold leafed version of this mischievous cat. In that case, we added a collar on the cat and left it copper-colored so it would contrast nicely against the golden cat. Our customer even requested we gild the five individual mice! 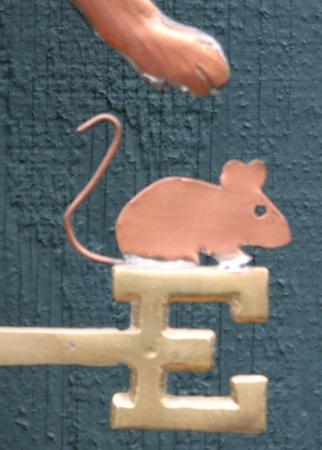 The mice can be made in silhouette form (included in the standard price), or swell bodied with glass eyes as an option. 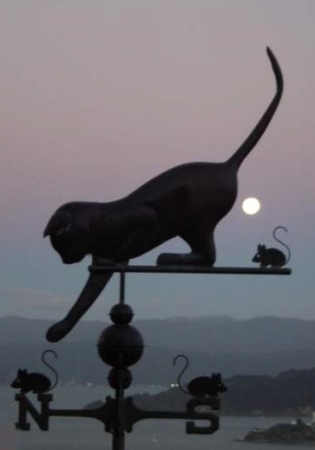 The silhouette form was popular in early Victorian weathervanes and makes for a well defined profile against the sky. Customers who opt for swell-bodied construction are generally wanting an added depth and dimension to their sculpture piece. 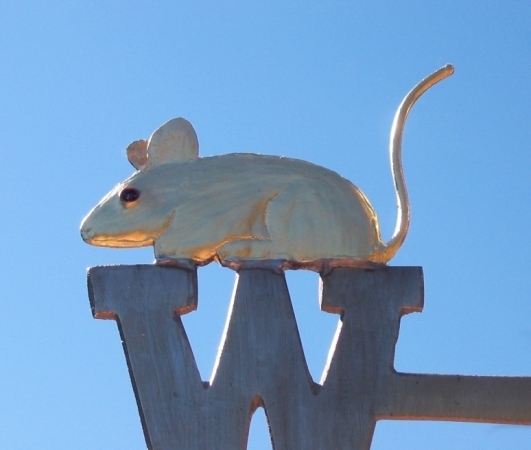 Howsoever the mice are constructed, they sit on each weathervane directional. 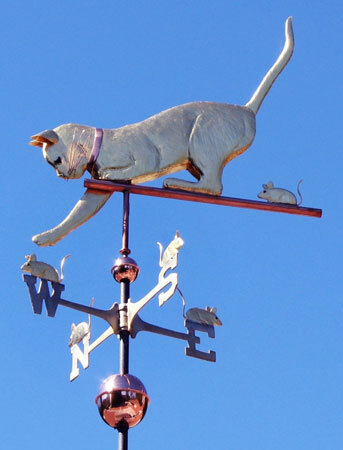 When the wind blows, the cat looks like it’s playing with the mice. 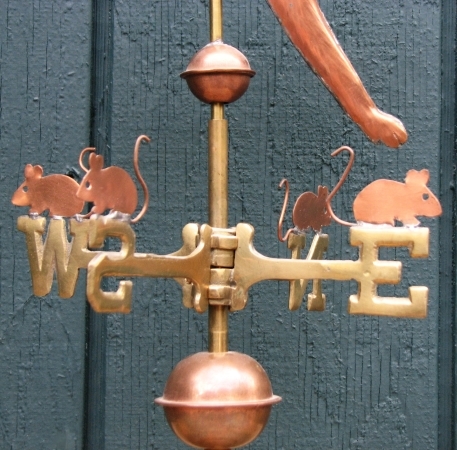 The idea of incorporating the directionals into an active design element of the turning weathervane is an original design concept by West Coast Weather Vanes. We have used this concept on a number of our pieces, such as our Robin Chicks, Wine Bottle with Wine Glasses, and Hunting Bald Eagle Weather Vanes. 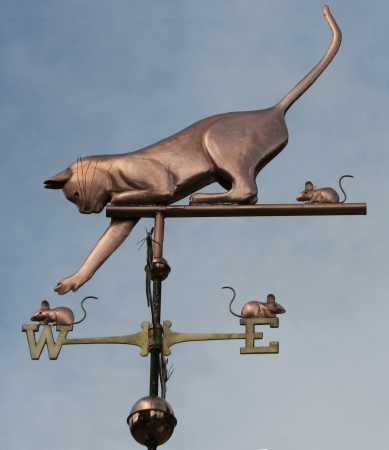 Our design concept has now been copied by many other vane makers, especially those who stamp out weathervanes overseas, but when compared side by side, we think quality always speaks for itself. 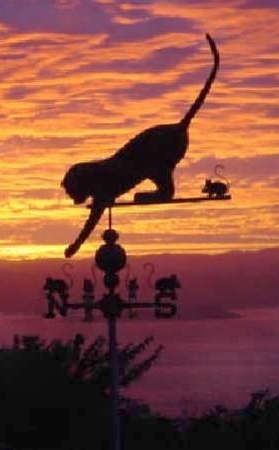 We invite you to provide photographs of your feline pets for a customized weather vane depicting your favorite kitty. 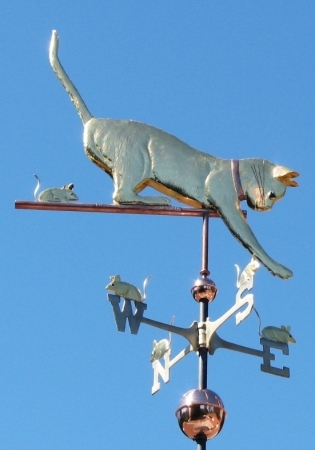 One of my favorite variations of this weathervane was a portrait of a cat who had a pronounced crook in his tail. Seems he didn’t make it through a screen door in time but this did not prevent him from waiving it proudly as he made his daily rounds in the neighborhood! He is now immortalized on the roof above his owner’s home. Cats are also famous for their nine lives. Myths from around the world attest the cat’s incredible agility and dexterity, especially when falling. A well developed inner ear may be the reason for their ability to land on their feet but for hundreds of years this amazing skill was attributed to extraordinary good luck. In China, and many other countries with similar myths, nine is considered an auspicious number, hence the association of nine with a cat’s well developed survival skills.